Nigeria stands as the only largest country in Africa and also the pride of Africa as well as the black race. Nigeria stays on top economically, politically, religiously, in sports, population wise and in other spheres of life endeavors for many years and that was exactly the major reason the country is regarded as the giant of Africa. It is a well known fact that the perceived greatness of Nigeria and those that made it happen are people who do not know that they are being used. This people are the hardworking Biafrans scattered in all parts of the contraption called Nigeria and other places around the globe. What beats the imagination of any reasonable human beings is the level of marginalization, maiming, annihilation meted on the Biafran people who are the real source of the greatness Nigeria claims to possess. Upon all these, Nigerian government still marginalize the people of Biafra with reckless abandon. The high level of inhuman treatment on the Biafran people by the Nigerian government and her citizens up North (owners of Nigeria) were the major reasons why Biafrans have decided to fight for their freedom and uphold their right to self determination, a right that is enshrined in the United Nations charter on the rights of the indigenous people all over the world. This bold step taken by Biafrans to demand for their own nation, since the protection of their lives and property can not be guaranteed in Nigeria even from inception, led to the free fall of Nigeria in all sectors around the world. The once celebrated African giant now drags her feet and is struggling for survival. The people of Biafra as a peaceful nation have tried several times in different occasions to proffer solutions on the best ways both Nigeria and Biafra can co-exist and cohabit in peace and harmony, but all the efforts put in place proved abortive. This is due to the fact that the Hausa Fulani and Yorubas who claim 'ownership' of Nigeria have refused to give peace a chance. They claim they are born to rule, they planted inequality and cultivated injustice. They structured the country in a way that they have more representatives in government than their counterparts from Biafraland. This they did regardless of the fact that the resources Nigeria use in running her affairs comes from Biafraland. So many political and religious analyst have argued that there is no amount of efforts put in place that will ever make the problems wrecking Nigeria to exit because the parties involved do not agree in working together anymore and the truth remains that two can not work together unless they agree, hence the need to dissolve the union between Nigeria and Biafra, for its better for each sides to take their destiny in their own hands and develop at their own pace. Presently, there is nothing that makes Nigeria giant of Africa because the country suffers a lot of difficulties and challenges ranging from lack of electricity, poverty, hunger, political thuggery, corruption et cetra. There ought not to be power failure in a country that have massive oil wealth. Many neighboring African countries that Nigeria gives power never experience power interruption, but in Nigeria power interruption has become a culture. Biafrans should as a matter of urgency rise up to their feet and fight for their rights. Mazi Nnamdi Kanu of Indigenous People of Biafra (IPOB) has paved the way for others to follow and we must not let this opportunity pass us by. Oh giant of Africa! Giant of fraud! Is this how you are gradually fizzling out from the surface of the earth? Is this how you are about creeping into becoming a history? Ooooooh giant of Africa! British Lord Lugard creation! Is this how you have fallen beyond repair? If that is the situation, then rise no more. 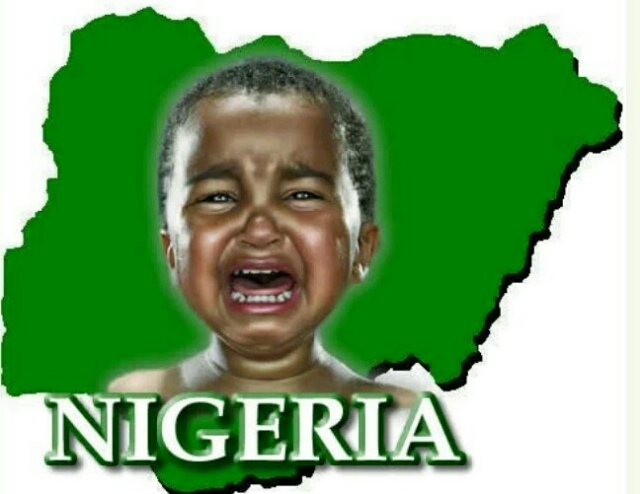 Rest in peace Nigeria. And from your ashes comes the land of the rising sun, Biafra!